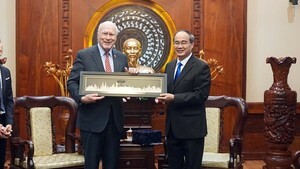 Secretary of the Ho Chi Minh City Party Committee Dinh La Thang yesterday said that the city would still ensure social welfare, educational investment and medical development although the Government has decided to reduce the city’s annual budget keeping the rate from 23 percent to 18 percent in the phase of 2017-2020. The statement was made to reassure voters in District 3 who expressed concerns about the budget cut. According to Mr. Thang, the budget reduction will affect socioeconomic development however the city has much potential to exploit and make up the cut. At first, the municipal authorities will curb expenses, use the budget efficiently and prevent waste in public investment. The City will intensify social investment mobilization from domestic and abroad sources to implement projects under BT (Build-Operate), BOT (Build-Operate-Transfer) and PPP (Public Private Partnership). At present, capital source from residents is very large and overseas remittances to the city approximate US$5 billion a year. Things that the city need to do now are to build a mechanism and create public confidence to raise these funds. The City's Party Chief revealed that the budget keeping the rate cut has been applied not only to HCMC but also other provinces and cities nationwide with large budget revenues. He hoped that voters will share difficulties with the country and the city. Despite the budget reduction, HCMC will still efficiently implement its seven breakthrough programs, which the city Party Committee congress’ resolution has defined, those are to ensure social welfare, improve education and develop healthcare, he affirmed. Citing Secretary General Nguyen Phu Trong’s judgment about corruption fighting, Mr.Thang says that the issue is the concern of the entire society, state and party for relating to the country’s development and regime survival. The party and the Government have made much effort in anti-corruption, which he said a very complicated work, and gained some certain results. In the upcoming time, they will continue carrying out more drastic measures with high and enduring determination to tackle the issue. 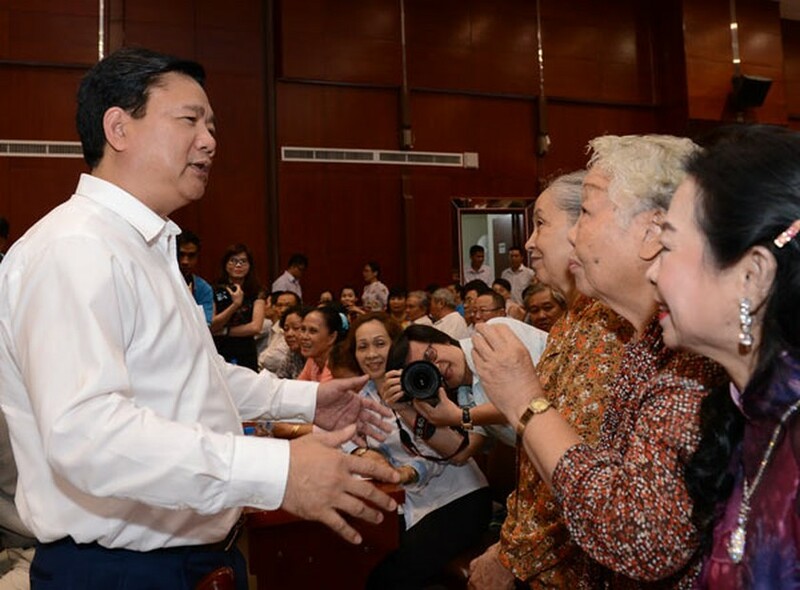 At the meeting, Mr. Thang warned voters of conspiracy by hostile forces who have taken advantage of the corruption problem to oppose the party and the state. Voter Tong Son Hai from District 3 worried about trillion dong loss in making projects and proposed to clarify the responsibilities of relevant sides and strictly handle them to avoid wasteful projects. Mr. Thang said that the inspection of those projects had been conducted from previous tenures instead of starting in the current term. In the upcoming time, the Government will continue reviewing projects of ministries, agencies and localities and comprehensively estimate them to have solutions to minimize damage, he said quoting an instruction by the Prime Minister at the recent session of the National Assembly. Voters in the district also reported some other issues such as overloading curriculum of students in educational stages, unemployed bachelors, brain drain and long complicated land and housing procedures. In addition, they suggested the city to pay attention to the daily life of drug addicts at rehabilitation centers and not to implement the policy to take them back to their families. In the afternoon on the same day, the secretary met voters in Districts 1 and 4. Ms. Duong Thi My Dung from District 4 concerned that traffic accidents have recently occurred continuously killing many. Mr. Le Minh from District 1 said that the National Asembly (NA) supervision activities have been conducted well however authorized agencies have showed limitations in uncovering corruptions. Most of cases have been disclosed by the press before the agencies started investigation. So he proposed NA deputies to closely supervise these agencies to prevent negative problems from occurring.